First, Introductions. I'm your great-great-granddaughter, Jenny. You begat Mary Ann who begat Eva who begat Barrie who begat me. So I'm creeping onto the London with you, Rebecca, hiding under your skirts, a wraith of the future. I'm sidling up the gangplank, glad to leave these murky London waters. Those are the opening lines of a book that definitely had me beguiled from start to finish. It's non-fiction but written in a narrative style that makes it as fascinating as any historical fiction. Using the journal of the ship's surgeon and that of a cabin passenger the author has created a daily record of the lives of the 258 steerage emigrants on board the ship 'London' bound for New Zealand in 1842. Each chapter begins with a journal entry and it is the doctor's that make the most heartbreaking reading. "Henry Edwards much worse, diarrhoea still continues, child evidently dying." Day after day the entries record the sick and the dying - children lose parents and parents lose children. The conditions were appalling, cramped and unsanitary accommodation and poor food meant sickness and disease was rife. As the journey progresses the author breathes life into names on a passenger list ; we discover the lives they left behind and share their dreams for the future. Who will flourish , who will founder and who won't even make it to their new homeland? 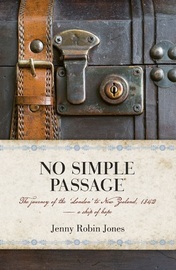 Jenny Robin Jones has researched the families and moved ahead 20 years to answer those questions and give an account of how the emigrants will fare as they struggle to survive in the early days of the founding of Port Nicholson (now Wellington, our capital city). Fascinating to experience major historical events and natural disasters like floods and earthquakes through the eyes of ordinary people rather than detached accounts in a history book. The book is enlivened with delightful pen and drawings, some lovely photographs of paintings and at the back there is a list of notes, illustrations, an index and a bibliography. A lovely book which was a pleasure to read and high on my list of favourites for 2011. This sounds absolutely incredible! I've not heard of this one before, but I am completely pulled in by the narrative non-fiction and the subject matter seems enthralling. Sounds like a book that I wouldn't be able to put down. Seems like the previous comment was meant for another blog post. Anyway, I meant to say that this book sounds interesting, although I don't usually read non-fiction that much. But the opening lines got me intrigued! Putting this book in my wishlist. Natalie & PL.....if you're interested in history and genealogy you'll enjoy it and it's very easy to read.